If you are unable to make the packet pickup, YOU MUST pick up your race packet and timing bib 30 minutes prior to your bus loading time. You must have timing bib to board the bus, and no timing bibs will be issued out at the respective starts (other than for the kid’s races). Official 2019 Pocatello Marathon Race Duffel Bags (i.e., duffel bag, backpack or other style) will be given to each Marathon, Half Marathon, 10K, and 5K participant during the Race Packet Pickup at the Clarion Inn from Noon to 8 PM Friday, August 30, 2019. The duffel bag will include your timing bib, 2018 Pocatello Marathon – Running the Gap – shirt, and other goodies. PLEASE NOTE: LATE Registrations and anyone not picking up their official 2019 Pocatello Marathon Race Duffel Bag at the Clarion Inn on Friday, August 30, 2019 will not be guaranteed a bag. An alternate bag (e.g., left over duffel bags from previous years) may be provided. Our host hotel is the Clarion Inn; Packet Pick-up, Expo, Pasta Dinner, etc. including great group rate – $90.00 plus tax. Rate available Wednesday August 28th through Sunday September 1st. Click lodging link for more details. Marathon participants MUST maintain a pace under 14 minutes 53 seconds per mile. Half Marathon participants MUST maintain a pace under 20 minutes 36 seconds per mile. 10K participants MUST maintain a pace under 36 minutes 17 seconds per mile. 5K participants MUST maintain a pace under 67 minutes 44 seconds per mile. 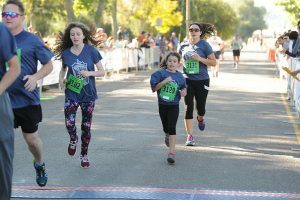 Participants will be given verbal notification if they are over the course close time pace, and then they will have the next mile to get back under the course close time pace. Transportation is REQUIRED to any participant who is then unable to maintain the course close time pace for the remainder of the course. Chip timing will be used for marathon, half marathon, 10K, and 5K events – ABSOLUTELY NO EARLY STARTS!! ALL EVENTS CLOSE AT 12:45 pm. For Kids “2” (0.2 miles) registration open only to those 11 years old and younger. Starts at 10:30 am. Start will be to the west side of the Idaho Central Credit Union Finish Line Arch. Look for “Start” flags on the grass area adjacent to the main finish line on S 2nd Avenue. For Kids “2” will be have wave starts with the following waves which may be combined as needed depending on the number of participants in the various age groups; 11 year olds, 10 and 9 year olds, 8 and 7 year olds, 6 and 5 year olds, 4 and under. Each participant receives a short sleeve microfiber 2017 Portneuf Health Partners Pocatello Marathon Running the Gap shirt and finisher medal. NOTE: For Kids “2” (0.2 miles) IS NOT a timed event and additional awards (i.e., overall, 1st, 2nd, or 3rd place) WILL NOT be awarded. 1 mile MaraFUN registration open only to those 18 years old and younger. Starts immediately following the For Kids “2” (0.2 miles) event (which starts at 10:30 am). Start will be to the west side of the Idaho Central Credit Union Finish Line Arch. Look for “Start” flags on the grass area adjacent to the main finish line on S 2nd Avenue. NOTE: The 1 mile MaraFUN is a timed event and additional awards will be presented. Details of the age groups will be based on the number of participants, which details may not be available until the day of the event. Each participant must pick up their official 2019 Pocatello Marathon Race Duffel Bag at the Clarion Inn during the Race Packet Pickup from Noon to 8 PM Friday, August 30, 2019. Anyone not picking up their race duffel bag on Friday, August 30, 2018 will not be guaranteed a bag. Each participant picking up their race packet MUST present their confirmation email and show a valid ID. Entry fees are non-refundable and non-transferable. However, anyone who registers but is unable to participate may pick up their duffel bag and shirt at the Packet Pick Up. Anyone not able to participate and that does not pick up their race packet may have their duffel bag and shirt delivered to them for a $15 shipping and handling fee. Any registered participant wanting to change events may be charge a $5.00 processing fee plus the difference in registration fee if the change is to a longer distance (i.e., half marathon to marathon would be $5 + $10 = $15 total). See the REGISTER link for the difference in event registration fees. To change events; send an email to pocatellorun@gmail.com requesting the change. 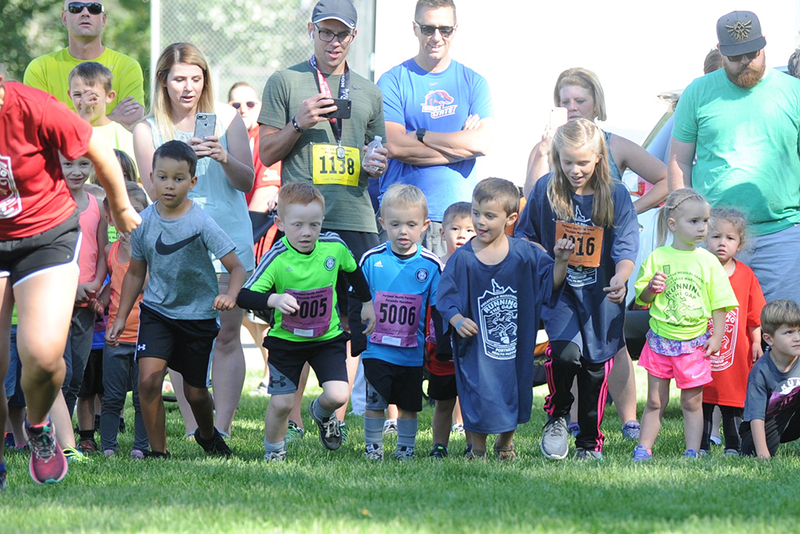 Each person who registers will receive a 2019 Portneuf Health Partners Pocatello Marathon Running the Gap shirt. Marathon participants will receive long sleeved microfiber T-shirt. Half marathon, 10K, and 5K participants will receive short sleeved microfiber T-shirt. Females will receive a feminine cut micro-fiber shirt unless they indicate a unisex sized shirt during the registration process. Anyone that does not pick up their race packet will be responsible for shipping and handling fee to receive their shirt. Each person who registers will receive a 2019 Portneuf Health Partners Pocatello Marathon Running the Gap duffel bag. LATE Registrations are not guaranteed a 2019 duffel bag, an alternate bag (e.g., a duffel bag from prior year) may be provided to those registering late. 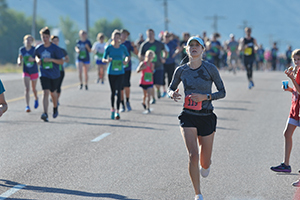 All finishers will receive a 2018 Portneuf Health Partners Pocatello Marathon – Running the Gap finisher medal. Course is USA T&F certified (Certification Number: ID16002LAB see map for details). Times on this course may be used to qualify for the Boston and New York Marathons. PLEASE NOTE: Due to road closures and detours ALL PARTICIPANTS MUST RIDE THE BUSES – NO PERSONAL VEHICLES ALLOWED AT THE START LINES. Transportation will be provided to the starting line. Duffel bags will be provided at the Race Packet Pickup to each person who registers. These duffel bags will be marked with your bib number and name. Use these duffel bags to place extra clothes that you are wearing to the start or want at the finish line. We will have a gear check in location at the start of each event. The checked gear will be transported to the finish line while you are running. A gear pick up location will be available in the finish line area. You MUST present your bib to receive the checked gear – each person checking in a bag needs to check the bag back out – no picking up multiple bags. There is no parking at the starting areas and due to road closures and detours you may not even be able to drive near the starting areas so use the provided transportation. Buses will leave PROMPTLY at the times indicated – so be on the bus early. DO NOT park on any streets or at any other businesses. Half Marathon, 10K, or 5K participants staying at Clarion or nearby hotels and needing a ride from the Clarion Inn (1399 Bench Road) to Ross Park Aquatic Complex – Shuttle buses will start to load at 5:50 am for anyone needing transportation to Ross Park. Buses will leave at 6:00 am, 6:10 am, 6:20 am, and the last group of buses will leave PROMPTLY at 6:30 am. Anyone riding these buses from the Clarion Inn to Ross Park must exit at Ross Park and then board their appropriate bus (i.e., the shuttle bus you ride over to Ross Park on may not be going to the start line you need). HALF MARATHON, 10K, AND 5K EVENT PARTICIPANTS will load/depart from ONE and ONLY ONE location out to their respective start, and that location is at the Ross Park Aquatic Complex, 2901 S 2nd Avenue. Aid stations will be located approximately at mile marks 3.3, 5.3, 8, 10.4, 12.7, 14.4, 16.2, 18.6, 19.7, 20.7, 21.7, 22.7, 23.6, 24.6, and 25.3. Each aid station will have water, PowerAde (one of three flavors at an individual aid station – either Mango, Fruit Punch or Mountain Blast), vaseline, ibuprofen, and band aids. Clif Shot energy gel will be available at the Mile 12.7, Mile 20.7, and Mile 22.7 aid stations. Bananas and oranges will also be available at Mile 5.3, 16.2, 19.7, 22.7, and 24.6 aid stations. Assorted wrapped hard candy will be available at Miles 8, 14.4, 18.6, and 21.7. A porta-pottie will also be located near each aid station. AWARDS for Marathon, Half Marathon, 10K, and 5K events: 1st place Overall Men and Women Awards, 1st place Masters Men and Women Awards (overall based on gun time), and 1st, 2nd, & 3rd place Age Group Awards (age group based on chip time) will be presented. Overall and Masters winners will NOT be included in their age group awards. Award presentation will begin at approximately 11:15 am. Awards will not be released prior to the awards presentation. Award recipients not able to stay for the awards presentation must make delivery arrangements at the Awards table in the finish area. A $15 shipping and handling fee will be charged for all awards that need to be delivered. The age groups for men and women include: 9 & under, 10-14, 15-19, 20-24, 25-29, 30-34, 35-39, 40-44, 45-49, 50-54, 55-59, 60-64, 65-69, 70-74, 75-79, 80 and over. Strollers, bikes, and pets are not allowed on course. Strollers will only be allowed in the 0.2 mile kids event. Post Race Shuttle Service from Ross Park Aquatic Complex back to the Clarion Inn – This one way shuttle service from Ross Park back to the Clarion Inn will run every 30 minutes, with the first bus departing at 9:30 am. The final bus will leave at 1:15 pm. The Ross Park Aquatic Complex locker rooms and showers will be open at 9:30 am and will be available for race participants to take a shower following their event. Last access to the locker rooms and showers will be at 11:30 am. Anyone using the showers MUST be out by 12:00 pm! Food and beverages will be provided at the finish area for race participants. Additional food and beverage vendors will also be at the MaraFest at the finish area. MaraFest includes music, free kids’ activities and more. Toast your run through the gap with Miller Lite or other adult beverage provided by TEC Distributing! Participants of legal drinking age will receive one FREE beer with their race bib. The beer garden will also be open to spectators with $2.00 beers. Don’t forget your ID. No ID – No beer! Race Packet Pickup will be Friday, August 30, 2019 from NOON to 8:00 pm at the Clarion Inn. — Participants unable to be at the race packet pickup on Friday MUST pick up their race packet including their timing bib starting approximately 30 minutes prior to loading their bus for transportation to their respective start area. A packet pickup table will be near the loading point of the buses. Each participant MUST have their timing bib prior to loading the bus – timing bibs WILL NOT be handed out at the start line. — Participants may have a friend pick up their race packet and timing bib, BUT that friend MUST have a copy of your confirmation email. Confirmation email with assigned bib number will be emailed the week of August 26, so watch for your confirmation email starting Monday, August 26. NOTE: Official 2019 Pocatello Marathon Race Duffle Bags are not guaranteed for anyone not picking up their race packet on Friday, August 30, 2019. NO RACE DAY REGISTRATIONS OR CHANGES – VERIFY Name, Age, and Event by checking the “Who is Registered” list. This list will be updated approximately every Monday from August 7 through August 26. This list will be updated one final time by Wednesday, August 28, 2019. Email any changes to PocatelloRun@gmail.com prior to Midnight on Saturday, August 24 or be at the packet pickup on Friday, August 30, 2019. Pasta dinner is Friday, August 30, 2019 from 5:00 to 8:00 pm at the Clarion Inn for race participants, family, and friends. Pasta dinner will be $12 per person in advance and $15 per person at the door. Children 12 & under will be $6. Pre-registration for Pasta Bar recommended. Pre-registration available during online registration. Lodging is available at the our Host Hotel the Clarion Inn. See the Lodging link for other hotel options. As the Host Hotel, the Clarion Inn is the place to be for the race packet pick-up, pasta dinner and a great night’s stay. 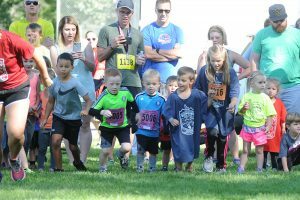 POCATELLO MARATHON RATE $90.00 plus tax. Rate available Wednesday August 28 through Sunday September 1. On-site is our delicious Steakhouse and relaxing lounge. Our comfortable sleeping rooms are a perfect fit for the leisure traveler as they are equipped with wireless internet and working space so you can stay connected. Our atrium is home to our beautiful indoor pool with waterfall surrounded by live foliage, Jacuzzi, dry sauna, 24-hour fitness center and meeting area.